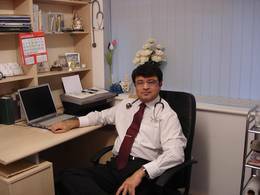 Dr. Nikunj Trivedi began his carrier as a medically qualified homeopath, ranked first in University and has been practicing homeopathy since 1980 in India and from 2004 in UK. He is currently based in Leicester-UK, from where he runs his very busy clinical practice with his wife - Dr. Amita. He has been involved in treating Infertility and Chronic cases with his wide experience of modern medical investigations, combining with Homeopathic totality to prove the effectiveness to restore the abnormal pathology to normal physiology. In his career of 35 years, he has treated wide spectrum of patients from all over the world and given numerous lectures at various institutes. In addition to this, Nikunj`s articles are regularly published in various Homeopathy journals. Nikunj specialises in treating fertility problems and chronic diseases and has authored four books on the subject. Nikunj holds a lifetime membership of the Homeopathic Medical Association of India (HMAI) and GHMA-India. He joined the Homeopathic Medical Association (HMA) (UK) in 2004 and has since then been actively involved and currently serving as a HMA Council Officer. His aim of promoting and raising awareness about Homeopathy are in parallel with the HMA’s aims. Nikunj has held several charity clinics and regularly participates in the Homeopathic Awareness Week. He also runs free sitting in clinics and clinical training sessions for students and homeopaths.